Jammu, February 09 (Scoop News)-Divisional status for Ladakh will boost region’s development. Stated MLC Chering Dorjay, BJP Senior leader & former Minister, in the presence of BJP State General Secretaries Dr. Narinder Singh and Yudhvir Sethi, at party headquarter, Trikuta Nagar. 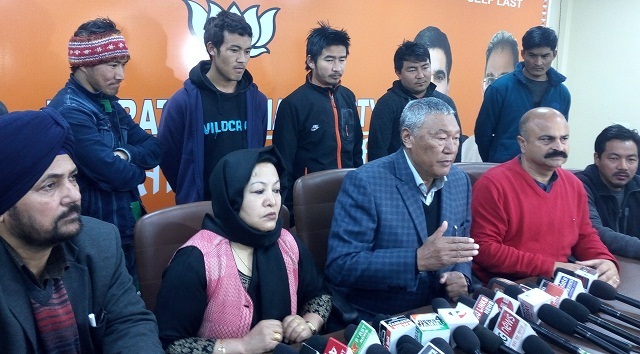 Dorjay was also accompanied by Councillor LAHDC Leh Sayeeda Ladakhi, youth leader from Zanskar, Namgyal Phunchok and other BJP leaders from Ladakh region. Chering Dorjay, while addressing the media fraternity, welcomed the decision of the Bharatiya Janata Party led NDA government for creating a separate Division for Ladakh and thanked the most popular leader of masses, honourable Prime Minister Narendra Modi and honourable Governor of Jammu and Kashmir for giving Ladakh its long due share, while requesting that the nomenclature of the state be changed to Jammu, Kashmir & Ladakh. Dorjay, claimed that this is huge step towards the economic, cultural and administrative strengthening of the region. this will also be a step towards the end of discrimination with the Ladakh region which was there for decades together. No previous government or administration paid heed to our demands, our sufferings, our needs for the last 70 years and this is the only Modi ji led government that has taken this historic decision, and we are grateful to BJP and its dedicated leadership for this, claimed jubilant Dorjay. Dorjay also congratulated the people of Ladakh region for this big achievement and termed this as the victory of their long struggle for self-esteem. According to him, the people of Ladakh are celebrating this as a gift from our Prime Minister on the occasion of “Ladakhi Lunar New Year”. He also thanked the honourable Prime Minister for announcing a cluster University for the Ladakh region, dedication of 220 KVA transmission line from Srinagar to Leh at cost of 2000 crore rupees, laying of foundation stone of Leh terminal building at cost of 480 crore rupees and dedication of 9 Mega Watt Dah Power Project to the people which he did during his last visit to Leh on the 3rd of February.